Powerful and Inspiring! See article & video below. Shelburne &Area Feral Cat Rescue gets support from Robert F. Hall High School Student. and Feral Cat Rescue Club have been very busy in support of this worthy cause. The club makes cat Toys and on days like this day, which occurred on Earth Day, April 22nd, Kendra visited Shelburne's Centennial Hylands Elementary School participating in a fundraiser selling the cutest decorated cupcakes. this kind of effort has a rippling effect in the community as youngsters can see Gray as a role model making them aware of their surroundings. Knowledge is power and kids take notice of the cause Gray is participating in, possibly passing the torch to the youngsters empowering them to make a difference as well. Yet another example of Shelburne's "GOOD STUFF" and for more information on Shelburne's Feral Cat Rescue, visit http://www.feralcatrescue.ca/ and find out more about upcoming events. The head of Shelburne's Feral Cat Resuce is beyond dedicated and relentless in her efforts to do the right things by these innocent creatures. 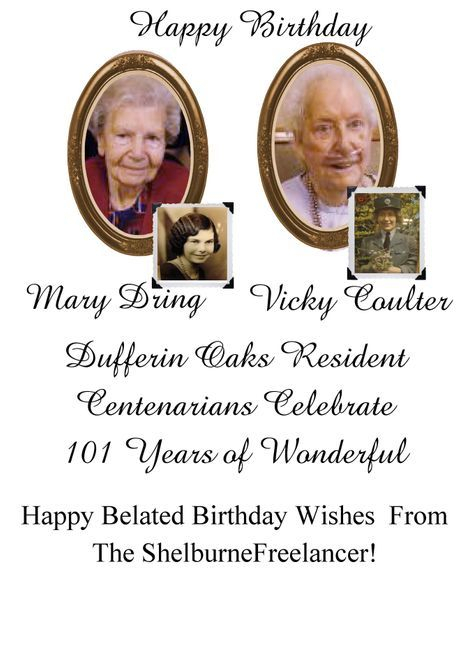 Special Thanks from the Shelburne Freelancer in Support of Morden's ongoing efforts. Earlier this month, Shelburne residents and business owners in the strip plaza on Shelburne's Main street enjoyed a reprieve from the pothole turned hazardous incident waiting to happen. As time passes, the pothole, if possible, is slowly reforming to it's former glory, causing grief to both residents and owners of the strip mall, Doreen and Merlen Kropft. The Shelburne Freelancer is in communication with the Kropft's and will continue to update Shelburne residents. On Monday April 20th, Sergeant Kerr, a 30 year veteran of the Shelburne Police Service was awarded a thirty year service medal by Len Mikulich – the chairman of the Shelburne Police Services Board, and Chief Moore. Sgt. Kerr’s entire policing career was with Shelburne Police Service which started in 1985. “Sgt. Kerr has been a dedicated and reliable police officer for the past thirty years. He has consistently demonstrated integrity, good judgement and authenticity when working with members of the public as well as other professionals. I want to take this opportunity, on behalf of the Shelburne Police Service, to sincerely thank Sgt. Kerr for thirty years of superior service”, states Chief Moore. Sgt. Kerr continues to serve the community as a member of the Shelburne Police Service. Below(LtoR) Chief Moore and Sergeant Kerr. The above and photos below provided by Shelburne Police Service. (LtoR) Shelburne's Chief of Police Kent Moore and Sergeant Kerr. (LtoR) Shelburne's Sergeant Kerr receives 30 Years in Service Award presented by Chairman of the Police Service Board, Len Mikulich. President of the Shelburne & District Horticultural Society reveals upcoming events during an exclusive Video interview with The Shelburne Freelancer. This is one of those very important topics society doesn't really think about until it's too late. Food comes from seeds and seeds come from where, exactly? Article to follow shortly at shelburnefreelancer.com in Editorials. Shelburne Councillor Wade Mills presented Al Widbur with the Town of Shelburne Community of Excellence Award, the highest honor available, acknowledging Widbur's contribution, volunteer service and devotion to his community. Although the presentation had been intended to occur at the council meeting, Mills was able to make the presentation at the E.D.C Annual Breakfast Meeting held on Thursday, April 23 at the Legion branch 220. Video brought to you by shelburnefreelancer.com Sharing Shelburne With The World! Did you "Get Your Greek On' at My Crafty Neighbours 1st Annual Spring Craft Sale Event held at the Legion Branch 220 over the weekend of April 25th? Tithorea attended delighting taste buds with everything olive in their wide variety of olive products directly from Greece. What a treat for the tastebuds! In this exclusive interview, Tithorea owner, Dora Tsagais expalins more about her business' history and olives. Go to shelburnfreelancer.com to view more vendors who attended the wildly successful Event. Catered to a "Full House." (L)Shelburne Councillor and this year's Chair of the Economic Development Committee's Annual Breakfast Meeting, Wade Mills, briefly explains how The Town of Shelburne is working towards an even brighter future. Early to bed, early to rise! See you at the Economic Development Committee Breakfast held at the Legion, 7.am! Vandyk Update on the Neighbourhoods of Summerhill development. Go to editorials in the option bar. Meet Jake(Golden Retriever on the passenger side) and the 1965 Ford 100 he allows his owner to drive! Go to 'more' in the option bar and choose Classic Cars. Article on Big Bucks is up. Go to 'more' in the option bar and choose Classic Cars. On the evening of April 20th, former Mayor of Shelburne, Ed Crewson, now Liberal Candidate for Dufferin-Caledon, along with fellow Peel Regional Candidates welcomed Leader of the Liberal Party, Justin Trudeau to Mississauga during a special, 'by invitation only' meeting. Accompanied by his wife, Wendy Crewson, commented via a social media feed, "It was very exciting to meet Justin Trudeau last night at a reception for Peel Region candidates and to hear his positive message for Canada.With hope and hard work, together we can do better." Looks like just what the Government of Canada doctor ordered, an injection of Ed Crewson to the rescue! Yes we can do better and with Ed Crewson's vast knowledge and experience, we very likely will! Sherry Culling, Provincial Service Officer, will be visiting the Shelburne Legion Branch 220 on Wednesday, April 22 at 10.am. If you would like and appointment the Legion asks you to call ahead and book an appointment at 519-925-3800 or contact Ross Warman, Branch Officer at 519-925-5017. Shelburne Fresh Variety is already preparing for a busy summer and the beautiful array of summer plant selection are already trickling in. Conveniently located at 604 Owen Sound St., this variety store featuring fresh produce is a staple in in the community and relied upon by their neighbourhood. Yet another great part of the quaint community of Shelburne. Keep your eyes open for more great plants coming soon! Patrick Boyd is not very old, in fact as the picture portrays, he is precisely, 'this many'. At just three, he was able to assess the difficult situation of helping Mom carry a huge bag of carrots, (almost the same size as he is) and so determined, Boyd actually did make it to the door of The Market, 'Your Country Store'. Boyd determined there were three steps required to get those carrots to the door ensuring his Mom could make him carrot juice. If lifting doesn't work, dragging is an option! & the girls go shopping! Melancthon residents, Cheryl Bauman and her adorable,10 1/2 month old daughter Miranda took advantage of the beautiful weather over the passed weekend to have a mom and daughter day, stopping at Shelburne's newly renovated Giant Tiger. Jay Walsh and his family are new to Shelburne from Orangeville. 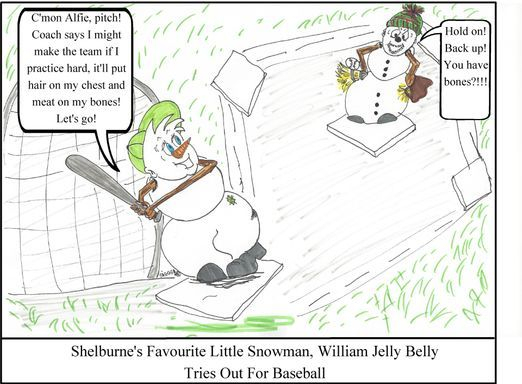 "We love life in Shelburne. It's quiet and there are kids in our neighbourhood. Our kids have already started making friends. It's great," commented Walsh. Just one month in, and Shelburne life suits the Walsh family very well. Walsh points out, "We also wanted a bigger house at an affordable price." With four children, the Walsh's family are taking advantage of the wonderful family oriented environment Shelburne has to offer. Walsh confesses, "It was a great idea to come here and it was my wife's idea." Welcome Walsh Family, from The Shelburne Freelancer, Sharing Shelburne With The World! (Above)Meet J.J Walsh, 2 1/2. A little camera shy, I wonder if he's thinking,"If I close my eyes, maybe you'll disappear!" (Above) Video : (Photos:(L to R) Six year old Brooklyn Walsh. Just lost a tooth, new to Shelburne and loving it! Becca Walsh, 8, pleased to meet the Shelburne Freelancer and is also the mastermind behind the idea to video how much fun she and her family were having on a cold, sunny Sunday. See video below. Thanks Becca! See why two, ten year old best friends came to Shelburne for the afternoon. See video. Go to Sports in the option bar. Go to Sports in the Option bar for more information on sign ups! Only $15! What Came First, The Chicken Or The Dinosaur? Something you don't find everyday..
With yard pick up and grooming, comes the inevitable blisters from raking and many things to pick up in the way of trash that has been buried under snow. But look what was found in one yard, buried in the bark mulch without a nest in the tree above? Definitely a "what the heck" moment. goose egg? Dinosaur egg? It's fairly large in size which can entice the imagination, however unlikely the possibility, however, the question begs to be answered.. How did it find it's way buried in mulch? Submit theories to alex@shelburnefreelancer.com or comment on the The Shelburne Freelancer facebook page, and better yet, post children's responses. We might learn something. Something to think about to kick off a wonderful Spring Friday in the community of Shelburne. Happy Friday folks and have a safe weekend. Jr Schooners Minor Softball are looking for kids to fill a few spots on some of our teams. If you have kids between the ages of 10 and 18 yrs old we have spots avail. Special thanks go out to Landlords Merlen and Doreen Kropft for completing Phase I of the repair of the very huge and dangerous pothole located on their property in a strip plaza on Shelburne's Main Street. 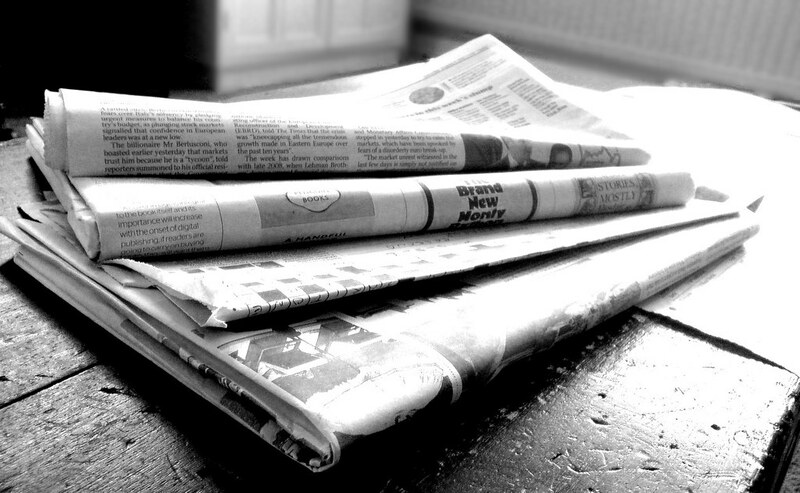 You heard about it first at The Shelburne Freelancer, Sharing Shelburne With The World! Emanuel & Annie Bauman of Badjeros, ON, travel to Shelburne on most Saturdays and are frequently stationed at Shelburne's John's No Frills. Thankfully for the Shelburne Community, No Frills owner, John van Teunenbroek is always eager to help the community whenever he can and allows many groups be stationed immediately at the store's entrance. As a result of van Teunenbroek's generosity and business like attitude, the Bauman's are able to bring 100% Natural Maple Syrup, tarts, treats and spreads to the community of Shelburne. For more information on the Bauman's products, call 519-923-0291. 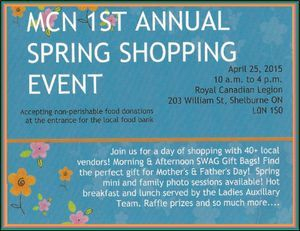 Annual Spring Shopping Event ! You can be just in time to pick out that perfect unique Mother's Day Gift item. With over 40 vendors to choose from, shop local, save time travelling and find that perfect handcrafted item. Fifteen direct sale vendors will be on hand, including The Market, Your Country Store,and Pazazz, (Fine Women's Clothing & Accessories)ensuring a wide variety of choices to be had. WWII Veteran Steve Chamula received his Quilt Of Valor. Go to 'more' in the options bar and select Shelburne Legion Branch 220 to find out more. Girl Guides from across the world have taken part in a Twinning Program. According to the Girl Guides' website, this strong tradition of Twinning involving the World Association of Girl Guides and Scouts, (WAGGS) and other Member Organisations around the world encourages international friendships among the girls creating a wonderful cross-cultural learning experience that lends itself to a broader international perspective. 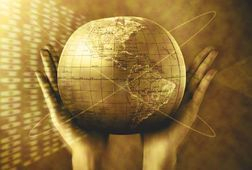 The Twinning 2020 Initiative; Connect Grow and Impact. For more information go to www.girlguides.ca. 1st Shelburne Girl Guide Leader, Angele Bernier-Hagell, commented, " Senorita Kot, the little mascot began the journey in Chile as part of the Twinning Program. He gets sent all over the world. We picked him up in Guelph. The girls have made a binder of pages filled with his adventures, information about other members and we will add to it too." Abigail Hagell explained what the money from the Girl Guide Cookie sales goes to. Well, we're raising money by selling Girl Guide cookies to pay for girl guide events, camps, crafts and supplies." Supporting our local guides is a great return for only $5.00 a box! Go to www.facebook.com/TwinningChileCanada2020 for more information. (L to R) Kayleigh Turner, Girl Guide Leader Debra Terpstra,Emily King, Payton Williams, Girl Guide Leader Angele Bernier-Hagell, and Abigail Hagell. As of Tuesday, April 14th, at 12:55 p.m, the 21 year old woman remains in critical condition at Sunnybrook. The investigation is ongoing. The Shelburne Police would like to hear from anyone who may have witnessed anything that may be relevant to this collision, no matter how minor they may believe the information to be. Please contact the Shelburne Police at 519-925-3312. Valerie McGrady, Head of Canada's First Bravery Park is on a mission to make it this park the best it can be. "This will be a place for veterans to reflect on what they have been through. A place of thought, contemplation and hope. Cenotaphs honour our fallen soldiers. Bravery Park will honour all Veterans, passed and present." Quote taken from McGrady's information flyer. McGrady recently visited the Shelburne Legion Branch 220 and met with Veterans. McGrady explained the present progress of the building of the park asking for continued support, and experienced opinions.
" The land we looked at belonged to Orangeville Hydro, Ontario Energy Board, and it was donated to the Town of Orangeville saving the town, $200,000. The park will have a Victoria Cross which will be inlaid stone work, statues, a LAV III (All Land Terrain Vehicle)is also something we are hoping to acquire. We have a great Board established. We just need more support to make it happen. Letters of support can be sent to vmegrady56@gmail.com. We are also applying for a Trillium Grant this summer. We have a website that explains more, visit www.BraveryPark .com. The website is also moving towards educational information packages that schools can use, attracting young people, keeping them aware. People can donate by dropping off checks to Orangeville Town Hall and just write right on the check, "Bravery Park" and the money will go right into our account," commented McGrady. According to McGrady's information flyer, "The park is born of an idea from Valerie McGrady to have something positive come from the loss of her own son, Orangeville native, Matthew McCully. Cpl. McCully was killed by and IED in Afghanistan. Orangeville has rallied behind the park, but we still need help from people like you to make it a reality." The Flyer also points out,"Join us in completing a first of it's kind in Canada, a park dedicated to the Bravery of our veterans. Not just those who have fallen, but to all who have served , or continue to serve,to protect our great nation." While some might see a huge pothole, others might see a refreshing place to rest, splash about, have a bath. Landlord's of the strip plaza located on Shelburne's Main St., Merlen and Doreen Kropft were surprised to see the magnitude of the pothole and are eagerly searching out repair methods that will be taking place very soon. In a telephone interview, Doreen Kropft commented,"We are aware of the pothole and and it will be repaired shortly." Merlin Kropft was especially surprised to see the size of the pothole commenting,"We will repair it our expense." Winter wreaks havoc on long strips of pavement as Shelburne and world all know. Happily this problem will be resolved soon and Shelburne's Main Street and business owners of the strip mall can once again park in safety. Economic Development Committee Breakfast information now available. Go to "more" in the option bar and select Shelburne Town Hall News. At 2:35 pm this afternoon Shelburne Police responded to a serious collision involving two pedestrians and two motor vehicles.The two pedestrians, a 21 year old woman and 28 year old man, were transported to Headwaters Hospital in Orangeville by Dufferin Ambulance Service.The 21 year old female has since been air lifted to Sunny Brook Hospital in Toronto and is in critical life threatening condition.The 28 year old man was treated at Headwaters for minor injuries and has been released from hospital.None of the vehicle occupants suffered any injuries. Main Street (Hwy 89) is closed between Victoria Street and Jelly Street. It is expected to be closed for approximately another 6 hours as Shelburne Police continues the investigation. Shelburne Police has requested the assistance of Technical Traffic Collision Investigators from OPP. The Shelburne Police would like to hear from anyone who may have witnessed anything that may be relevant to this collision, no matter how minor they may believe the information to be. (LtoR) Find out what hockey players Amelia Soucy, Kristy Lemoine, Leanne Doig, Michelle Thompson, Sarah Thornington and Andrea Whitten of the Third Line Wings had to say about The Jennifer Widbur Memorial Hockey Tournament and why it's important to them to attend. Below exclusive video interview brought to you by the Shelburne Freelancer. The Jennifer Widbur Memorial Hockey Tournament of 2015 was once again a huge success drawing over 1000 people from the Dufferin Community coming together in a show of support in the fight to end Cancer. What makes this particular fund raising tournament singular is the number of people who knew Jennifer Widbur, went to school with Jennifer Widbur, worked with Jennifer Widbur and were friends and family of Jennifer Widbur. In order for this tournament to be the success that it is, the human element and the very heart of the story is Jennifer Widbur. When interviewing, every account of this woman was outstanding and absolutely solidifying in the opinion that Jennifer Widbur was and still very much is alive in inspiration, 'girl power', resilience, dedication, in the hearts and minds of family and friends. Widbur's optimism, will and grace as revealed by her friends who volunteered at the tournament depict a strong woman, a loving mother, dedicated wife and truly great friend. According to Widbur's husband, Mike DeLaat a now retired Centre Dufferin District High School math teacher , the Jennifer Widbur Tournament raises 50,000 a year and collectively over the last seven years donated $267,000 to Headwater's Hospital specifically for Cancer, $30,000 to the Canadian Breast Cancer Foundation, $30,000 to Honeywood Minor Hockey, and $5000 to Hospice Dufferin. DeLatt is very proud to explain that all money raised stays local. "Isn't it just wonderful? Honeywood is a relatively small place and just look what we can do!," commented DeLaat adding, "The weekend is a lot of fun and I'm guessing we'll see just about 1000 people over the course of the weekend. People can go to the website if they want to donate and the website will walk you right through everything. Donations are tax deductible. Just go to jwtournament.ca make a donation." (L)Mike DeLaat was very pleased with the turnout this year and it's plain to see there was hustle and bustle in the upper level of the arena where refreshments were being served, a silent auction took place, and many volunteers worked tirelessly during the the tournament which began Friday evening and carried over to Sunday. (Above) Jeniffer Widbur's Aunt, Linda Widbur. (Below) A family photo that is featured on display at the arena of Jennifer Widbur, Mike DeLaat and their two young sons. How many Volunteers does it take to manage Tournament? And just how many volunteers think this tournament is worth volunteering for? Between the raffle, the merchandise for the silent auction, the door and the 50/50 draw, the dinner and the bar, at least 48 volunteers were present the entire weekend, 20 referees, a number of time keepers, score keepers, game organizer, approximately 10 Executive volunteers to help organize, and at least 11 teams consisting of approximately 150 moms! Each team in Honeywood Minor Hockey donated a basket for Action and all of Dufferin and surrounding area contributed with items for baskets as well. People came to the tournament from all over the world. One special person in particular, Linda Widbur comes each year from Las Cruces, New Mexico, which is North of El Paso. Jennifer Widbur's Aunt bares a striking resemblance to her niece and as fate would have it, Jennifer "Linda" Widbur is her name sake. Where did the idea of a memorial tournament come from? Originally, following a treatment, Jennifer reportedly hoped to take up hockey with the other moms, so the interest was already peeked. Following Jennifer's passing the hockey moms mentioned the idea of a hockey memorial tournament to Mike DeLaat and the idea was brought to fruition with a group effort and a lot of 'heart' work. Matters involving the heart are always a labour of love and the communities of Honeywood and Shelburne, where Widbur worked at the RBC, the heart of the matter comes back to Jennifer Widbur. This report is not just about an annual ladies hockey tournament. This article is not about a woman who lost her battle to Cancer. Like the woman, it's about the life, Jennifer's Widbur's well lived life and the heart of the matter, her family and friends who love and miss her and the good that keeps her wonderful memory alive, a memory that will continue to fight the war against cancer, helping so many others along the way. An outstanding community effort that delivered above and beyond and with that type of community heart, the Jennifer Widbur Memorial Hockey Tournament is better and stronger than ever! Volunteers, the hockey players and more. Be sure to check out the Upper Grand District School Board Sunshine List for 2014. Go to 'more' and select School News in the option bar for more information. Many new events added to the What's Going On In April Page. The Street Festival &Classic Car & Motorcycle Show Committee is excited to introduce its 1st Annual Bed Race Competition. Go to 'more' and select Town of Shelburne News in the option bar for rules and registration information. The Market, 'Your Country Store' on Highway 124, just passed Shelburne Home Hardware Building Centre is now opened on weekends with a bunch of great new products to offer. Jennifer Widbur Memorial Hockey Tournament will be held this weekend at Honeywood Arena. Bravery Park update coming soon! See what's new at the Wool & Silk Company, go to 'more' in the option bar and select Arts & Entertainment. The weekly Shelburne Police update is available in Police news. THE GOOD STUFF! Meet a twelve year old local boy and find out how he will honor WWII Veterans and why. It's a proud moment and a bit of a tear jerker! Have a Super weekend Shelburne! 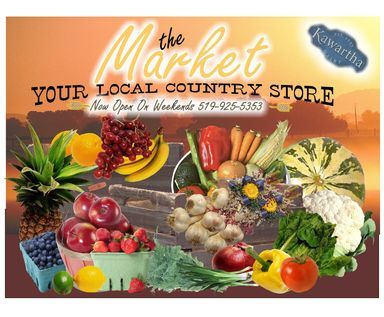 The Market, 'Your Local Country Store', located just passed Shelburne Home Hardware Building Centre at 300 County Road, (Highway 124) is now open on weekends. The Market owners, Doug and Virginia Hansford are looking forward to opening full time in a couple weeks.
" We really have some great new products! Yoga Tops, yes Yoga tops! We brought them in from a company based in Kitchener and they are priced just right at $19.99. Also, we brought in a line of high end soya candles and very unique enamel pots, very country-ish. And of course we are bringing in bulk mulches and top soil. Doug and I are in on Saturday and on Sunday from 10 a.m to 4p.m. and we look forward to seeing you," commented Virginia Hansford. Second year in business promises to be successful for the Hansfords with their unique gift ware and flair for country life from accessories to home made bread, diverse selection of specialty cheese and wide variety of fresh fruit, vegetables, and beautiful array of hanging baskets and plants. Treat yourself and take a peek! Supporting local businesses can be a very pleasant surprise! The Market is exactly that! For more information call the Market at 519-925-5353! Continuation of "A Sentimental Journey". to read the first installment. in the Youtube search bar. Huge Success and Ton of Fun! Not even the blustery winds promising snow over this Easter Weekend's festivities could keep over 300 Shelburnites away from the 2nd Annual Easter Egg Hunt sponsored by John's No Frills & The Town Of Shelburne held at the Centre Dufferin Recreation Complex (C.D.R.C.) on Saturday, April 4th. Excitement built in anticipation of the Easter Egg Hunt as "Story Time" got the event off to a wonderful start. Of course, what's an Easter Egg Hunt without chocolate Easter Eggs? John's No Frills saw to it that there would be more than enough for every child to find donating over 10,000 eggs in addition to other treats and donations of supplies helping to make this years event spectacular. Other contributing sponsors included Giant Tiger, Shelburne Legion Branch 220, Shelburne Lions Club, Ontario Egg Farmers, KTH Manufacturing, One Energy Center, LP Stage Productions, Dollarama, Small Town Family Dental, Shelburne Kinsmen, Shelburne Kinettes, Ganz Toys, Pace Credit Union, Scholastic Books, Shelburne RBC and Abiding Place Ministries. 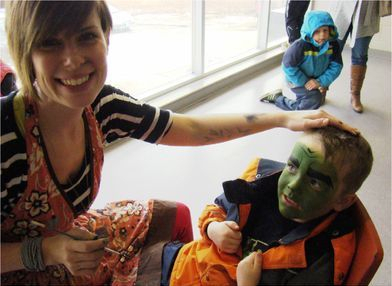 Face Painting, indoor arts and crafts, hot dogs, the Easter Bunny, and more! What a fantastic day and the Shelburne Freelancer has the photos to prove it! Once again the best little Town the Town of Shelburne shines even if the sun refuses and celebrated a most memorable Easter in 2015. John's No Frills and The Town Of Shelburne's 2nd Annual Easter Egg Hunt! Marketing Mommas exude girl power and smarts as they fill the upper level of the CDRC with small business owners, entrepreneurs, crafters and more. 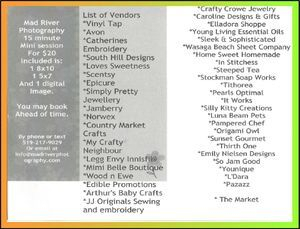 Perfectly timed with Shelburne's Easter Festivities, Marketing Mommas offer a new brand of marketing, facilitating, networking, all at affordable means to up and coming small business ventures, local businesses and create venues for shopping. Their name is perfect as they actually bring travelling markets to areas in and around Dufferin County. Attracting local small businesses with affordable venues is very appealing to local communities interested in shopping, and not having to travel to do so. In this case more is always better and Marketing Mommas have already exceeded their number of vendors attending events this year and truly can predict their futures are very bright. Fresh, innovative and in demand. Watch the video. Marketing Mommas explain what their strategy is and why it works. "If The Walls Could Talk"
within the beautiful structures of Dufferin County. President of Minor Fast Ball, Chris Wight has information on the upcoming base ball season and signs-ups. Go to Sports for the information video. 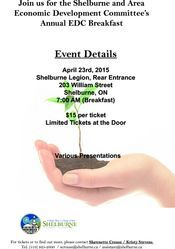 Go to more and select Shelburne Legion Branch 220 page in the options bar. I never thought it would happen, but April actually saw fit to finally arrive! Special thanks to this wonderful community for embracing The Shelburne Freelancer. 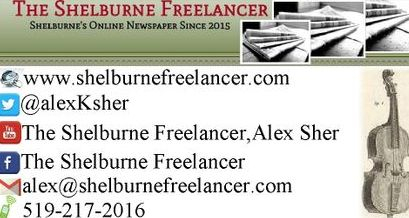 Since its inception, the Shelburne Freelancer has seen well over 2500 views from across Canada and the world! Hundreds from that demographic have viewed videos and thousands have like us on Facebook, Tweeted and peeked at us on Reddit. Imagine, all of this in just a few weeks! We are, all of us,capable of great things. I am very grateful for all the support. 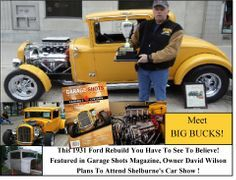 So much is always happening in our little Town Of Shelburne! Tipling Stage Company will be holding Auditions for their new play, What The Heart Wants, Thursday evening. Easter events include The Town Of Shelburne's Easter Egg Hunt, Marketing Mommas at CDRC for their annual Mega Sale, and Dufferin County Museum & Archives April 4th holding afternoon Children's Activities as precursor to their next exhibition, If Walls Could Talk. For more details, go to "What's Going On In April" in the option bar. Have a very safe and enjoyable Easter Weekend and I'll be seeing you! We Truly Are Sharing Shelburne With The World! and choose which month you would like to read.